Arnold Engineering (AE) has long built a reputation based on technological advancement. Located in Corona, Calif., the company has established itself as one of the world leaders in aerospace manufacturing. Founder Bob Arnold started the company in 1971, and he always saw the value of investing in machining technology, opting for the long-term solution over focusing on short-term gains. Now retired, Arnold’s philosophy still rings true with the company’s new leaders. So when faced with the problem of longer processing time due to intricate design, they took to their predecessor’s philosophy. Arnold Engineering needed a machine that could handle the intricacies of numerous complex pocket designs and awkward material angles. 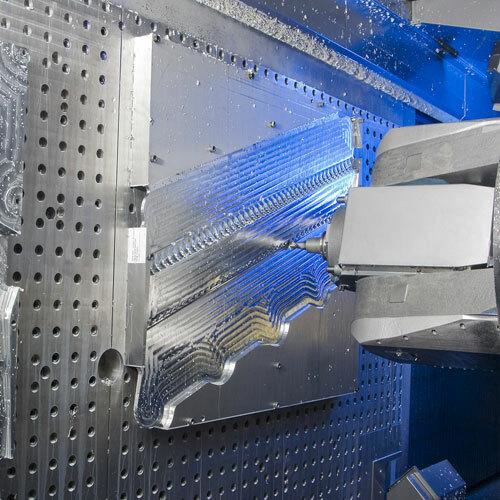 After surveying their options, they decided the Makino MAG3 5-axis horizontal machining center presented the features to match AE’s manufacturing needs. Boasting X-, Y- and Z-travels of 118.1 inches by 59.1 inches by 39.4 inches, respectively, and an ability to handle up to 6,600 pounds of payload, the MAG3 5-axis horizontal machining center is designed to handle the demands of modern heavy-production aluminum machining. The major point for AE was design flexibility, and the MAG3 offered just that. With plus or minus 110-degree A-axis movement, paired with unlimited movement capability of the C-axis, the MAG3 features unprecedented machine flexibility. That newfound machine flexibility enabled AE to streamline its production process, reducing setup times and giving the company the ability to maximize spindle utilization. The Makino MAG3 answered the call for Arnold Engineering, producing parts at a pace 60 to 70 percent quicker than in the past. Thanks in part to the MAG3’s ability to reduce the need for machine transfers, AE is producing more parts at a consistency that it hasn’t seen before. AE also credits the training team at Makino for helping it get the most out of the MAG3, and the company sees the partnership as a well of knowledge on efficient machining. AE doesn’t show any signs of slowing down, either. It has plans of expanding to a $100 million company. AE also expects to keep up with the ever-changing aerospace industry, delving into titanium and composite machining, and moving forward with Makino along the way.